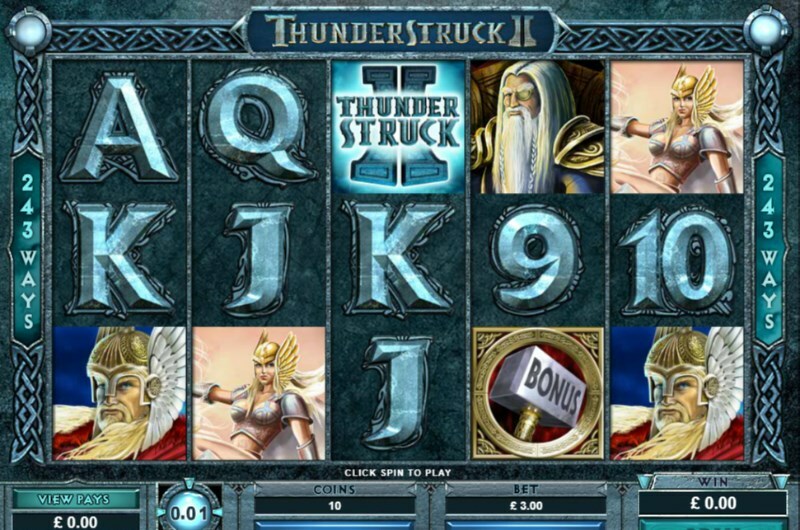 Thunderstruck II slots is the follow up to the critically acclaimed Thunderstruck slot. Both games were designed by Microgaming and are themed after the legends of Norse mythology. Since its 2010 launch, this slot has accumulated an army of fans, both offline and online. Starring gods like Thor and Loki, this 243 ways to win slot improves upon the original game in every way. From the crisp graphics to the smooth animation - Asgard has never looked better. The sequel also tweaked the bonus features. Many fans will tell you the highlight of the slot is the Thunderstruck II slots free spins - a bonus round that’s as mighty as Thor’s hammer Mjolnir. With a max win of up to 2,430,000 coins, this game can deliver some hefty payouts too. This Microgaming slot features a total of five game reels and three rows. There are no paylines in the game - as this is a "ways to win" style slot, a popular format for this developer. Wins are awarded from left to right; adjacent symbols on three or more reels can trigger a winning combination. Bets start from £3 a spin up to £15 per spin - this is a good budget slot for those starting out. For high rollers however, this level of betting may not provide the gambling opportunities you are looking for. The free spins feature activates when three hammer symbols appear. This will activate the Great Hall of Spins bonus round. In this bonus, you will be able to choose from four famous Norse gods to help you in your quest for a big slot win. Each god will award free spins with different features. Choosing Thor, for example, will activate rolling reels and thunderous multipliers. Here are all the potential bonus rounds you can choose. Valkyrie Bonus: 10 Free Spins / Winnings Multiplied x5 - this furious warrior goddess will simply multiply all winnings by five. Land three or more Thor hammer symbols and you will activate even more free games. Loki Bonus: 15 Free Spins / Wild Magic Feature - it's fitting that the trickiest god of them all would have a unique bonus. The god of mischief will send one of his magic wilds to the 3rd reel - which will randomly turn other symbols wild. Once again, free spins can be re-triggered by matching Thor's hammer. 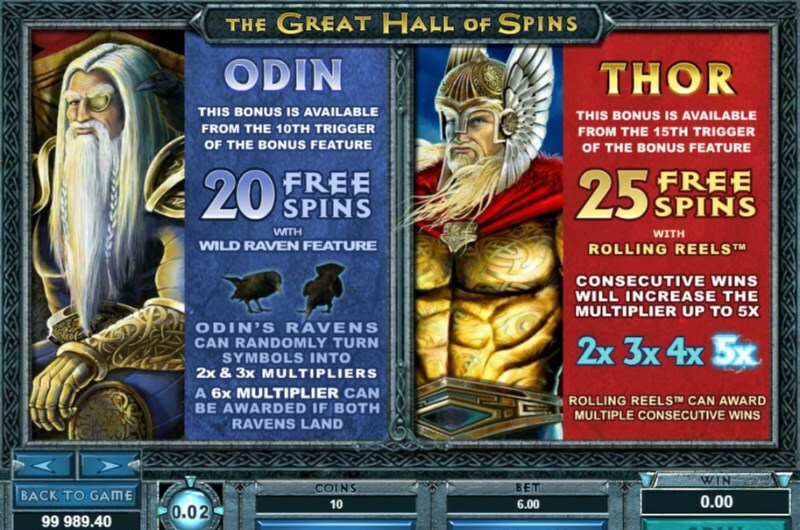 Odin Bonus: 20 Free Spins / Wild Raven Feature - Odin's raven partners have a keen eye. On each free spin, these feathered friends can spot multipliers of 2x or 3x hiding among the symbols. If both ravens land on the reels at the same time, then you will be awarded a 6x multiplier. Thor Bonus: 25 Free Spins / Rolling Reels + Multiplier - love tumbling reels? Then you will enjoy the thunderous action of rolling reels. Hit a win and the winning symbols will be removed from the reels, allowing more to join. Every win will also increase an electrifying multiplier. During base game play, there’s also a random chance for the Wildstorm feature to activate; Thor will crash into the game turning up to four reels wild. What a generous guy: we recommend you claim a Thunderstruck 2 slots bonus code to experience all these godly features. Microgaming have stayed true to the wondrous world of Norse mythology with this slot game. The reels and symbols fit the theme perfectly with long boats, a depiction of Asgard and Thor's hammer as the scatter symbol. We also have the four gods, who have been brought to life in exquisite detail. This is a marked visual improvement over the first game. And considering the slots are only five years apart in terms of age, the graphical improvements are even more impressive. 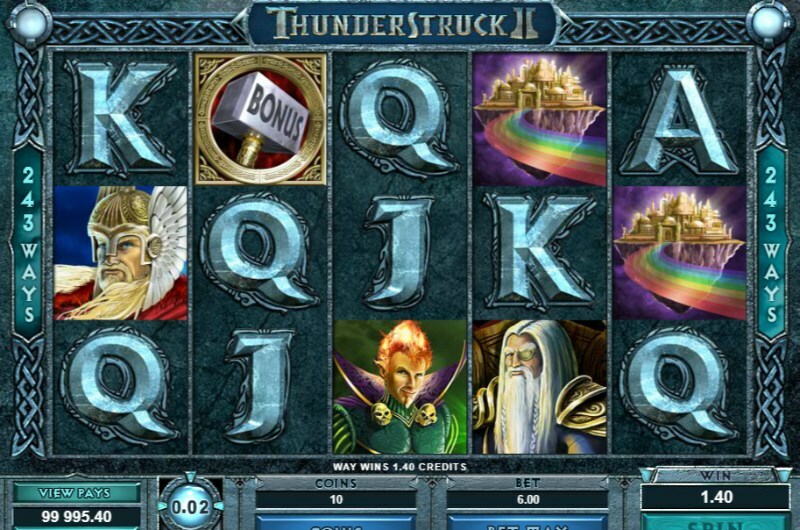 That's why most Thunderstruck 2 slots reviews will give this slot a 10/10 in the graphics category. We also have an epic sound score to listen to as we play. An uplifting orchestra provides the backing to every spin, creating a hair-raising atmosphere. Sound effects are impressive too; the satisfying thud as Thor's hammer falls onto the reels is almost like ear candy. To get started with Microgaming’s classic game, click the coins button to adjust your bet size. For more customisation, you can also switch to expert betting, giving you even more ways to adjust your spin cost. Once you are happy with your bet, press the spin button to start playing. If you need some pratice prior to playing - then we suggest some free spins no deposit offers to get you started. One lacking addition is autoplay functionality - which would make the slot far more appealing for power players. This means you do have to manually sit and spin. But considering the potential bonus rounds and rewards on offer, it's worth exercising that spin finger. Claim a Thunderstruck 2 slots signup bonus and you can look forward to an above average return to player of 96.65%. This is a medium variance slot, meaning a balanced blend of low wins and high wins. Asgard is a mysterious place of magic and wonder. And all it takes is one spin to land an electrifying win. From a £3.00 bet the multipliers can keep stacking up for wins as big as £20,000+. It has been reported that the slot can deliver prizes over 1000x your total staked bet too. 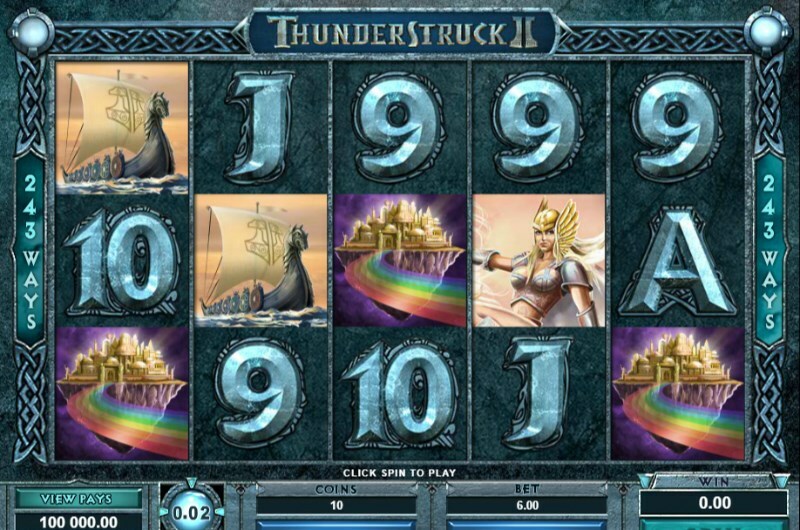 If you are blessed with the luck of the gods on Thunderstruck 2, then you can look forward to generous rewards. This is an example of a sequel that improves on the original in almost every imaginable way. The free spins in particular are simply unmissable offering tonnes of variety. Play Thunderstruck 2 online and you will not want to play another game again. Not only does the slot feature outstanding graphics and sound, the bonus round one of the best out there. Step into the realm of Asgard today; great fortunes are sure to find you!